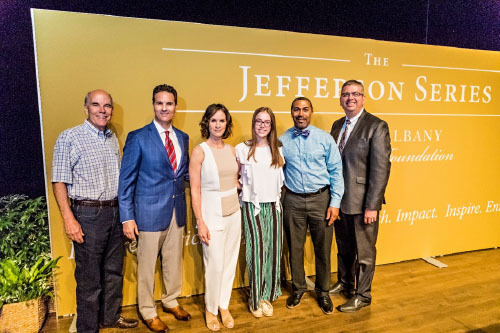 The New Albany Community Foundation welcomed Elizabeth Vargas, former co-anchor of ABC’s 20/20 and author of Between Breaths: A Memoir of Panic and Addiction, as the fourth and final lecture of the 2017-2018 Jefferson Series season. Earlier in the day, Vargas met with hundreds of students representing nearly 20 area high schools. She discussed how she worked toward recovery from addiction and anxiety. The conversation was an intimate reflection on her experiences. The authenticity of Vargas’ accounts, shared during the student lecture and the Jefferson Series evening lecture, allowed the audience to connect with her on a personal level. Vargas emphasized the importance of realizing that it is okay to ask for help if you need it. Beyond her battle with addiction, the students also gained insights on her journey as a respected professional in the highly competitive world of network television. At the evening forum, Vargas was introduced by New Albany Schools superintendent Michael Sawyers and interviewed by Stacia Naquin from WSYX ABC 6 / WTTE FOX 28. Naquin asked a series of questions relating to Vargas’ professional journey as well as her personal struggle with anxiety and addiction to alcohol. Vargas was open and honest with her responses, making the conversation relatable to all in the audience. She discussed the day-to-day challenges that many people experience, whether they are struggling personally with an addiction or have a family member or friend who is dealing with addiction. Vargas spoke of the emotions related to the feeling that, “Everybody else has it all together [except for me]” and how often it is difficult to realize that others also struggle beneath a strong exterior appearance. This was an important discussion as we endeavor to remove the stigma surrounding mental health challenges and engage in a community dialogue. Vargas was the third speaker the Foundation has hosted on this subject, following Mariel Hemingway and Patrick Kennedy. Award winning actress, Glen Close is scheduled to appear in January. The discussion with Elizabeth Vargas was made possible through generous support from the Donna & Nick Akins Fund, Karen & Irving Dennis Family Fund, Christine & Jeffrey Rodek Fund, Lynne & Steve Smith Family Fund, Leslie H. Wexner Jefferson Series Fund, Abercrombie & Fitch, Conway Charitable Lead Annuity Trust, Beatrice Wolper, Trustee, an anonymous donor, Turner Construction, AT&T, Mount Carmel Health System, Bob-Boyd Lincoln of Columbus and Lynne and Martyn Redgrave.